The ACXT545, the new Rugged-Ready 28 Mile Walkie Talkie from Cobra Electronics. Be prepared for storms and emergencies with built-in NOAA radio receiver. The built-in LED Flashlight and rubberized grips provide enhanced functionality to keep you on the go. VibrAlert. notifies you of incoming transmissions with ehanced vibrating feedback. Waterproof spec allows you to be ready for whatever mother nature can throw at you. Voice-activated transmission frees hands for other tasks. A total of 3124 channel combinations are available when the 22 channels are combined with the 142 privacy codes (38 CTCSS/104 DCS). The radios include rechargeable NiMH batteries and a two-port charging dock. May also be used with AA alkaline batteries. The Energizer Max Alkaline AA Battery (36-Pack) is laden with Power Seal technology to protect devices from potentially damaging leakage. They provide long-lasting power with a 10-year shelf life. Stock up now so you're not caught powerless later. It keeps going and going and going. 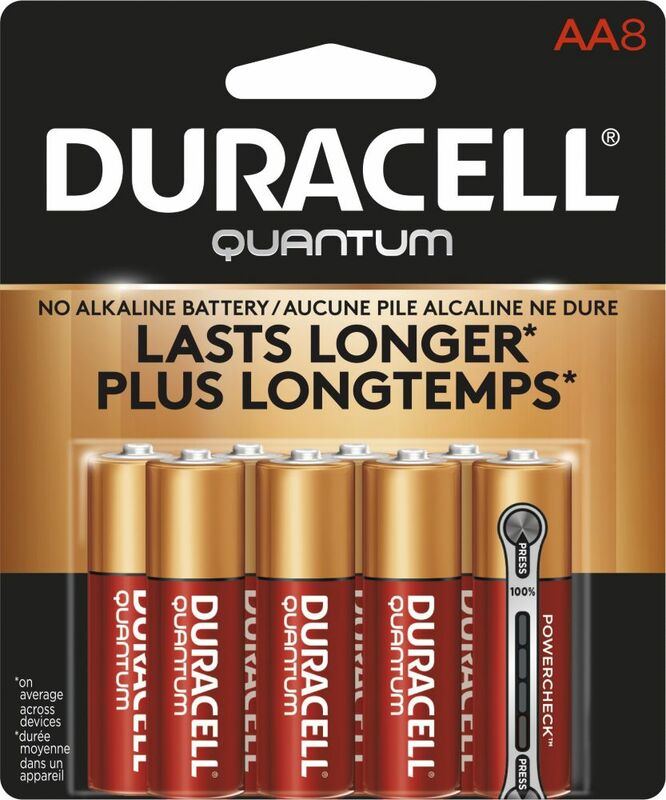 Quantum AA Alkaline Batteries 8 count is rated 4.8 out of 5 by 109. Rated 5 out of 5 by Jessie from Haven’t had these for a long time but so far... Haven’t had these for a long time but so far they are doing good. Rated 5 out of 5 by Guido from Excellent standby life and performance. Excellent standby life and performance. Rated 4 out of 5 by SonofAverageJoe from Only in bulk Bought a pack because I wanted to try out the new Duracell batteries. Pro: does exactly as it says with a four bar band on the side in 25% intervals but also with a slight shade change as the battery was in use. The battery doesn't last any longer than a normal Duracell or any less. I especially am happy with now knowing if it is my battery or my tool (flashlight). Neutral: Because of the real lack of difference between regular and quantum it is better if in bulk. Con: Unless used in frequently used tools or fire alarms this which need to be checked regularly battery is the same as a regular Duracell.